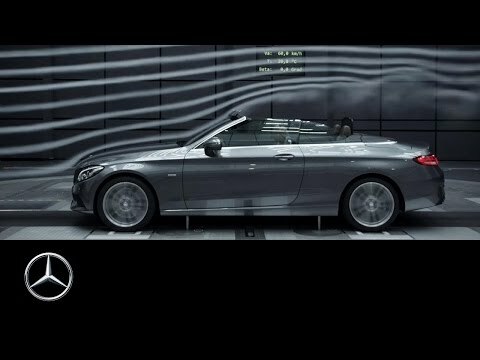 The all-new Mercedes-Benz C-Class Cabriolet brings open-top driving to the C-Class range. Its sleek coupé form is equipped with a selection of powerful yet efficient 4- and 6-cylinder engines, all engineered for precise, dynamic driving. At the top of the range, the C 43 4MATIC Cabriolet packs a punch with a 3.0-litre V6 biturbo engine and our legendary AMG Performance 4MATIC all-wheel drive. The result is 0–62 mph in 4.8 seconds. Inside the cabin, you’ll find an array of features designed to maximise comfort. Take the stylish sports seats with side bolsters and integrated headrests, providing excellent lateral support when cornering. Or the fully automatic soft-top, which you can lower in less than 20 seconds, and at speeds of up to 31 mph. And if there’s a nip in the air, the optional AIRSCARF neck-level heating and AIRCAP automatic draught stop system will ensure you and your passengers stay cosy – whatever the weather. Meanwhile the AMG line boasts signature AMG details like the multifunction sports steering wheel with flattened bottom section as well as AMG sports pedals. Also on board, the latest infotainment system with Live Traffic Information navigation and the innovative Mercedes me connect package including automatic emergency call, Accident Recovery, breakdown assistance and more. And with cutting edge safety systems like ATTENTION ASSIST and COLLISION PREVENTION ASSIST PLUS, in addition to the revolutionary Cabriolet roll-over protection system, you can enjoy extra peace of mind from the moment you set off.